Not surprisingly Group One winning sprinter Hard Spun has many fans amongst Victorian breeders, the former Darley shuttler proving a reliable source of winners - his time in the southern hemisphere yielding 13 stakes winners including the South African Group One winner Ertijaal and the recent Group One Randwick Guineas winner Le Romain. Also a northern hemisphere success story, the son of Danzig has been represented by 48 stakes winners worldwide, his best including the Group One winners Hard Not To Like, Questing, Hard Aces, Wicked Strong, Hardest Core, Smooth Roller and Zo Impressive. Hard Spun was the ideal horse for the owner/breeder, 82% of his named foals making it to the track, 66% being winners with his starters' average earnings sitting at just below $80,000. And so it is time for a son of Hard Spun to stand in Victoria and Riverbank Farm have come to the fore with the talented Late Charge to make his debut at the Benalla stud this spring. Described by Riverbank's Russell Osborne as "a lovely athletic type with the attributes of his sire," Late Charge has already settled in well. "He has a fantastic temperament," Osborne enthused - "he is super to handle and extremely well mannered." Making his debut at two at Echuca, Late Charge could not have been more impressive racing away, under hands and heels riding, to a 4 3/4 length victory. 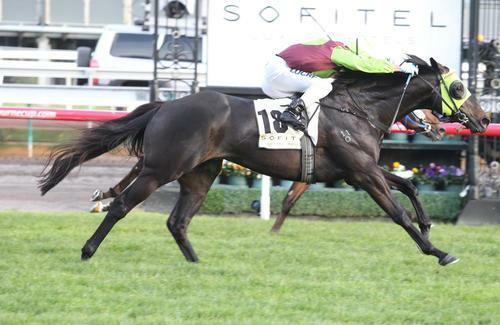 Stepping quickly up in class, the good looking entire swamped his rivals in a 1400m event at Flemington, recording another impressive winning margin of 2 1/2 lengths. Close up in his next two starts in stakes company as an early three-year-old, Late Charge was third in the Group Two Autumn Stakes the following summer and was in even better form during his next preparation, winning two in a row at Caulfield and Flemington. His victory in the Listed Tontonan Stakes was a particuarly gallant one, Late Charge covering ground from a wide gate and finding plenty to hold off all challengers. "He did super well," said his trainer Wendy Kelly whilst jockey Vlad Duric was also impressed, noting that "his class shone through." Retiring to stud as the winner of four of 13 starts and over $250,000 in stakes, Late Charge is described by Wendy Kelly as a horse who "had that little bit of something special, the x-factor that good horses need to have." Late Charge is a son of the Octagonal mare Fantagonal, granddaughter of the Group One South Australian Derby winner English Wonder - dam of the popular four times Group One winner Dr Grace (by Octagonal's grandsire Sir Tristram) and the Group One South Australian Oaks heroine Asia. This is a family of winners, Late Charge's first four dams between them producing 22 winners; other members of this consistent family including the stakes winners Whitefriars, Ringmeister, Calveen, Kosi Bay, Fireworks, Striker, First Impressions, Okahu Bay and One For One. Late Charge debuts at a great value fee of $2200. For further information on Late Charge who stands alongside Redente, Von Costa de Hero and Hillman contact Russell Osborne on 0423 768 155.